Ergonomics push radiology reading rooms into the future. By now, everyone is aware of the importance of ergonomics at radiologists' workspaces and in radiology reading rooms. What's new is the degree: Awareness has been ramped up to acute awareness, observes Greg Patrick, president of RedRick Technologies, a designer and provider of ergonomic radiology furniture. Increased awareness is partially attributable to evolutionary changes in the radiology environment. 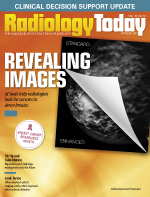 "Emergence of PACS and digital imaging brought a major change in radiologists' practice style," says Claire E. Bender, MD, FACR, chair of the ACR Commission on Human Resources. The ACR Commission on Human Resources will soon publish a study, "Work-Related Injuries of Radiologists and Possible Ergonomic Solutions," in the Journal of the American College of Radiology. The lead author is Gordon Sze, MD, FACR, chief of neuroradiology at Yale School of Medicine. The study states that the shift toward PACS and digital imaging led to an increase in repetitive strain injuries—most often manifested in pain in the upper extremities, neck, and back—and eye strain. Previous studies have reached similar conclusions about physical strain and resulting injuries. One, "The Agony of It All: Musculoskeletal Discomfort in the Reading Room," presented at ACR's annual meeting in May 2017, revealed that 87% of radiologists reported ache, pain, or discomfort in at least one body area at least once or twice a week. The most frequent locations were the neck (66% of respondents), lower back (61%), upper back (43%), right shoulder (36%), and right wrist (33%). Other reported pain symptoms included carpal tunnel syndrome, eye strain, and headaches. The authors concluded that, as radiologists work eight- to 12-hour shifts sitting in front of monitors, too much sedentary time not only causes pain but also increases the risk of serious illness, such as diabetes and cancer. In large part, Patrick attributes the increased ergonomic awareness to the ACR's Imaging 3.0 initiative. "There's a strong focus area on radiology in the initiative," Patrick says. "It has made radiologists more attentive about how ergonomics impact their environment and, in turn, their health." In addition to its focus on reducing injury, part of Imaging 3.0 involves what could be termed as a new role paradigm for radiologists—a more consultative role. "The goal of the 3.0 initiative is to bring added value to what radiology does and stands for," Bender explains. "It was meant to help develop and implement ways that radiologists can provide better patient and family care. Direct communication and consultation will help enhance the practice." Further, Imaging 3.0 requires facilities to create an environment that allows radiologists to be more accessible to technologists, referring physicians, and patients. The goal is to create an ergonomically correct, integrated service environment that allows the radiologist to provide patient-centric care. For health systems and facilities that seek to move in this direction, the environment means more than just a radiologist's workplace. Environment involves the larger picture: the workplace and the entire radiology room. As such, ergonomics involves more than a padded, comfortable chair to alleviate strain on the radiologist's musculoskeletal frame. "Ergonomics is the relationship between the person and the space they work in," Patrick says. "The additional environmental factors now being evaluated include lighting, noise reduction, wall colors, and additional workplace equipment, such as phones and dictation tools," Bender says. There's a good reason for this broadening focus. If radiologists are going to thrive in their new consultative role, they will need to be at the top of their game, so to speak. The proper environmental ergonomics will allow them to function at peak efficiency—while injury risks, discomfort, and stress will be greatly reduced. "Radiologists are being asked to provide an additional contribution, to be an engaged participant," Patrick says. "They will need the time and energy to do this. That entails greater consideration of how their working environment will allow for that." Working environment takes into account location as part of the ergonomic structure. Certain aspects of radiology isolate the department from the rest of the health care facility, observes Carrie Schmitz, ergonomic & wellness research manager at Ergotron, an ergonomic equipment designer and provider. Traditionally, radiologists have been "sequestered" in dark, solitary rooms. "Radiologists sitting at a desk in front of four or five monitors are like office workers in the sense that they have to deal with a lot of computer equipment in front of them. Their shifts are eight to 12 hours, and they are intensely focused on their screens. They aren't on their feet a lot. They have issues separate from health care in general," Schmitz says. "Unless you have a health system that is aware of what's going on everywhere, radiologists could easily be missed, and the department can fall through the cracks." Ideally, the new reading room/radiologist workplace will be closer to the patient. The relocated room should be designed to foster collaboration in group and one-on-one discussions and be a place where imaging studies can be viewed by all concerned: referring physicians, specialists, and patients. The combined tasks of upgrading workspace and workplace ergonomics, redesigning the reading room structure, and relocating the entire radiology enterprise may seem daunting, but the ACR isn't just advocating change or lobbying for new requirements; it offers help to sites in transition. One way it does this is with its Imaging 3.0 Accelerator Program (I3AP). The I3AP provides onsite visits to practices that are interested in redefining radiologists' role in health care and adopting value-based radiology concepts. The ACR designed the program as a jump start: The onsite visit is intended to identify opportunities to fully engage all radiologists and team members in some aspect of care transformation. In addition to identifying weaknesses, the I3AP helps practices recognize areas of strength in supporting the Imaging 3.0 concepts. Following that, the ACR provides practices with actionable items to help make improvements for both the short and long term. The ACR says the accelerator program was designed for practices that are unsure how to appropriately integrate Imaging 3.0 concepts. • The surgeon or nurse practitioner advises the radiologist in the clinic when there is a patient who might benefit from a consultation. • If necessary, the radiologist spends a few minutes reviewing the images and discussing the plan with the surgeon. It is critical that the whole team knows the treatment plan, as this ensures the patient does not receive a mixed message. • The surgeon lets the patient know that a radiologist will review the images and explain the findings in the consultation room. • In the consultation room, the radiologist briefly explains his or her role in the patient's care, reviews the images on a virtual desktop PACS, and gives the patient an opportunity to ask questions about anatomy, findings, and posttreatment changes—all in five to 10 minutes. • Make an ergonomic assessment of what can lead to pain or injury—for example, the right arm extended toward the mouse with the elbow too far from the body; the left arm bent sharply to support the microphone for long durations; monitor screens that are too low and small with chair seats too low, resulting in the knees being higher than the hips; low clearance between the thighs and the work top; the head, neck, and trunk twisted, not facing forward; or the ears not in line with the hips. • Use proper equipment—for example, padded chairs that support neutral posture with adjustable seat, back, and armrest heights; adjustable back and seat tilts; adjustable seat pan depth; a chair back equipped with adjustable lumbar, neck, and head supports; adjustable task light angle intensity locations; and sit-stand desks. • Use effective work practices such as Breathe, Blink, Break: breathe deeply, blink the eyes to lubricate them, and take frequent mini breaks. "With ergonomics, there are three domains that have to be considered: equipment, work practices, and administrative tasks," Schmitz says. The administrative domain involves shift considerations—making sure that people take their breaks every two hours—and establishing a wellness culture that reaches the most isolated people, even the remote radiologists. "That's a challenging domain, and that's where education needs to come in," Schmitz advises. Bender offers an example of an educational opportunity that involves an ultrasonographer. "Key factors in reducing injury include correct handling of the ultrasound transducer, patient position, the understanding and best application of body mechanics, and preventive training—stretching and strengthening exercises—specific to the task," she says. "My ultrasonography training program has successfully instituted a required course for understanding body mechanics of scanning and has regular musculoskeletal training classes." The benefits of ergonomics not only positively impact health but they also make for sound economics. Good ergonomics make for happy and healthy radiologists, reducing burnout and injuries, which negatively affect departmental productivity and, thus, are costly. In her webinar presentation, Schmitz emphasized the return on investment of healthy ergonomics. "The median productivity increase following an ergonomic intervention was 12%," Schmitz says. "New studies suggest that employees who are provided with well-designed ergonomic furniture and are trained to use it see an average 18% increase in productivity." A healthy radiologist is a productive one. That's why the focus on health keeps increasing. "It is important because it allows the radiologist to work longer and work more efficiently," Patrick says. "The benefits for both the radiologist and administration are longer careers, no lost time due to injury, and no worker compensation problems for the employer." Citing increases in productivity validated by studies, Patrick says, "It's a no brainer. Ergonomics makes for a good investment with a solid financial return. Injuries related to ergonomics are no less real and certainly no less costly than a worker in another industry breaking a leg." Ergonomic improvements lead to easier recruitment and longer retention. "Provide the tools; you'll spend less time recruiting, and you'll retain your work force," Patrick adds. Ergonomic equipment providers are upgrading their offerings to further the 3.0-driven transition. RedRick Technologies designs and builds customized equipment to suit its customers' specific ergonomic needs, specifically with radiology in mind. RedRick's products include three major functions. The first is expanded adjustability of its desktops, which accommodate 95% of the population in a sitting or standing position. The second is the capability to adjust an entire monitor set, not just one monitor at a time. "In some places, you'll find as many six monitors at each work station," Patrick observes. "Each one needs to be adjusted in height in relation to the desktop, the location of the keyboard, and the mouse. Monitors need to adjust in relation to that desktop surface." All adjustments align the shoulders, elbows, and wrists and allow for proper alignment of the neck. The third function adjusts the monitor—or focal—depth, the distance from the radiologist's eyes to the monitor. "That helps avoid undue eye strain," Patrick says. RedRick also offers light solutions that provide ambient light around the monitor. "The monitor itself already gives off illumination, so if you surround it with equal illumination, eye strain is lessened," Patrick explains. "The environment should not be overly bright, but we don't want an environment to be darker than the monitors. Both of those extremes cause eye strain due to pupils dilating." One of Ergotron's latest offerings is the Carl's Table CT15 for Radiology, a radiologic imaging workstation desk. The table's height and tilt can be adjusted with the push of a button. This enables the radiologist to work while sitting and standing. In this way, the user can stay energized and productive. The workstation also includes the electric Monitor Control System, which allows for adjustment of the entire bank of displays up and down, forward and back to the proper focal distance. Both companies' products are designed to support 3.0-inspired reading rooms so radiologists can be more productive. "The driver for that improved radiologist reading room is to keep a healthy workforce in this very demanding world," Bender says. "Keeping staff healthy and happy will hopefully keep them professionally satisfied, motivated, and performing high-quality and safe work, which results in high-quality patient care."